View this sample resume for child care, or download the child care resume template in Word. Working with children is no easy feat. And to be considered for top child care jobs, resume expert Kim Isaacs says it helps to have a comprehensive resume. 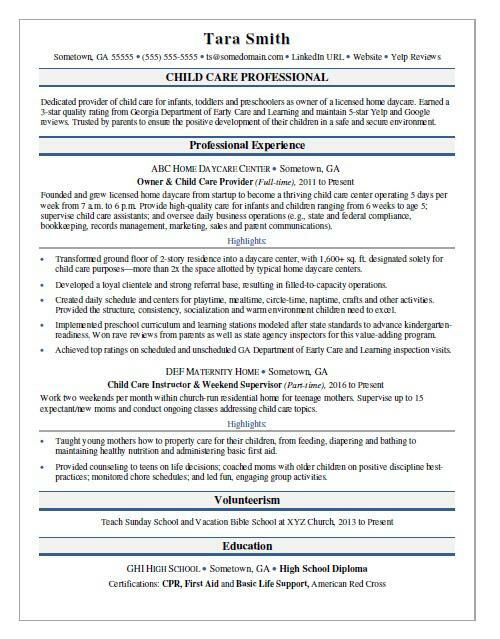 For resume writing tips, view this sample resume for a child care worker that Isaacs created below, or download the child care resume template in Word. And if you need more help, get a free resume evaluation today from the experts at Monster's Resume Writing Service. Jobs for child care workers are projected to grow by 7% (or 84,300 jobs) from 2016 through 2026, according to the Bureau of Labor Statistics (BLS). Unsurprisingly, you'll find the highest level of employment for this job in the following populous states: California, Texas, New York, Florida, and Pennsylvania; and in the following metropolitan areas: New York City, Los Angeles, Washington D.C., Atlanta, and Chicago. As a child care worker, you can expect to earn a median wage of $22,290 per year, or $10.72 per hour, according to the BLS. Additionally, you can learn about personal service careers and search for child care jobs on Monster. Dedicated provider of child care for infants, toddlers and preschoolers as owner of a licensed home daycare. Earned a 3-star quality rating from Georgia Department of Early Care and Learning and maintain 5-star Yelp and Google reviews. Trusted by parents to ensure the positive development of their children in a safe and secure environment. Founded and grew licensed home daycare from startup to become a thriving child care center operating 5 days per week from 7 a.m. to 6 p.m. Provide high-quality care for infants and children ranging from 6 weeks to age 5; supervise child care assistants; and oversee daily business operations (e.g., state and federal compliance, bookkeeping, records management, marketing, sales and parent communications). Transformed ground floor of 2-story residence into a daycare center, with 1,600+ sq. ft. designated solely for child care purposes¾more than 2x the space allotted by typical home daycare centers. Developed a loyal clientele and strong referral base, resulting in filled-to-capacity operations. Created daily schedule and centers for playtime, mealtime, circle-time, naptime, crafts and other activities. Provided the structure, consistency, socialization and warm environment children need to excel. Implemented preschool curriculum and learning stations modeled after state standards to advance kindergarten-readiness. Won rave reviews from parents as well as state agency inspectors for this value-adding program. Achieved top ratings on scheduled and unscheduled GA Department of Early Care and Learning inspection visits. Work two weekends per month within church-run residential home for teenage mothers. Supervise up to 15 expectant/new moms and conduct ongoing classes addressing child care topics. Taught young mothers how to properly care for their children, from feeding, diapering and bathing to maintaining healthy nutrition and administering basic first aid. Provided counseling to teens on life decisions; coached moms with older children on positive discipline best-practices; monitored chore schedules; and led fun, engaging group activities.